U2 have released a new album - which they're giving away for free. Songs Of Innocence will be available for free to iTunes users. The rockers made the unexpected announcement when they took to the stage and performed at Apple's unveiling event in Cupertino, California. Bono told Rolling Stone magazine that the album would be a "very personal" one. "Let's try to figure out why we wanted to be in a band, the relationships around the band, our friendships, our lovers, our family," he said of the thinking behind it. "The whole album is first journeys - first journeys geographically, spiritually, sexually. And that's hard. But we went there." All customers with iTunes accounts can download the 11-song Songs Of Innocence for free and t he album will be released to everyone else from October 14. 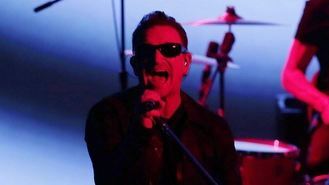 The album, produced by Danger Mouse with Paul Epworth, Ryan Tedder, Declan Gaffney and Flood, is billed as an exploration of U2's influences from the 1970s and 80s. The news, which follows much speculation over whether the band would release an album earlier this year, comes after Beyonce dropped her self-titled LP as a surprise on iTunes in December and it became one of the top-selling albums of 2014. Tom Petty gave away his new album with the Heartbreakers for free with purchase of a concert ticket. Bob Dylan, Billy Joel and Willie Nelson are among the artists performing Paul McCartney songs in a massive tribute to the former Beatle due out in November. DJ and chart star Calvin Harris has become the first UK solo act notch up more than one billion plays worldwide on music streaming service Spotify. Gene Simmons has claimed that rock music has been killed by file-sharers. Disco legend Nile Rodgers and his band Chic headlined the final night at Bestival, unveiling the world's biggest disco ball. The US girl group featuring tragic singer Simone Battle has achieved UK chart success in the aftermath of her death. Kasabian turned back the years as they celebrated the 10th anniversary of their self-titled debut album by performing the album in its entirety at the 2014 iTunes festival. Girl group singer Simone Battle has died. Lady Gaga has confirmed she is going ahead with her show in Israel despite the trouble in the region. Britney Spears has revealed that she is back in the recording studio.